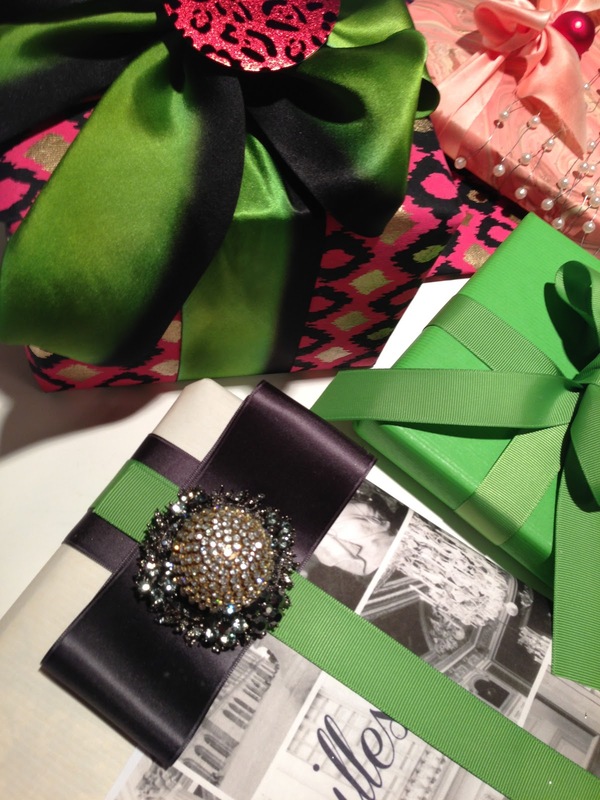 Two things caught my wrapping fancy this year. 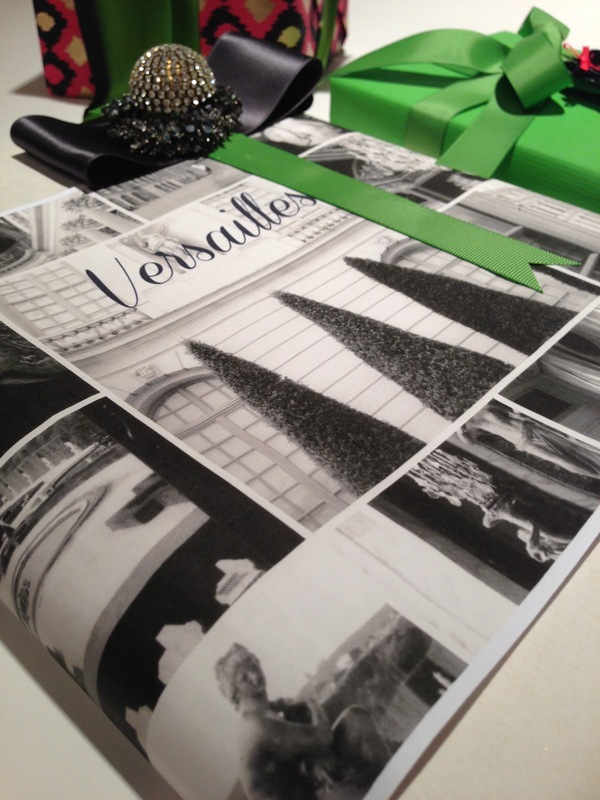 My photo montage of Versailles and the 2013 Pantone Color of the Year.......Emerald Green. 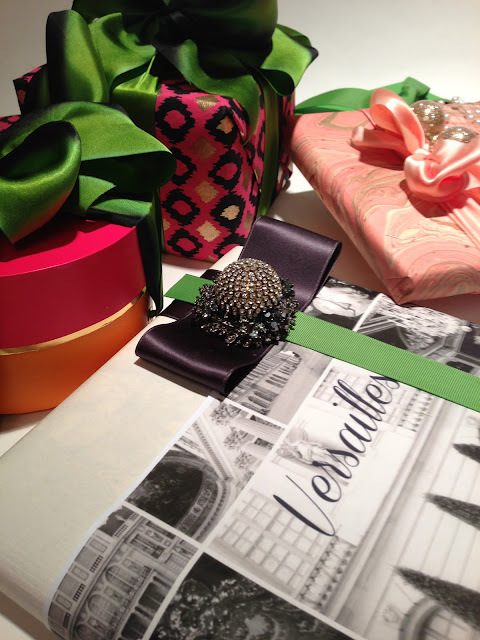 The Versailles photo montage is still being tweaked as a gift wrap for production in 2013. 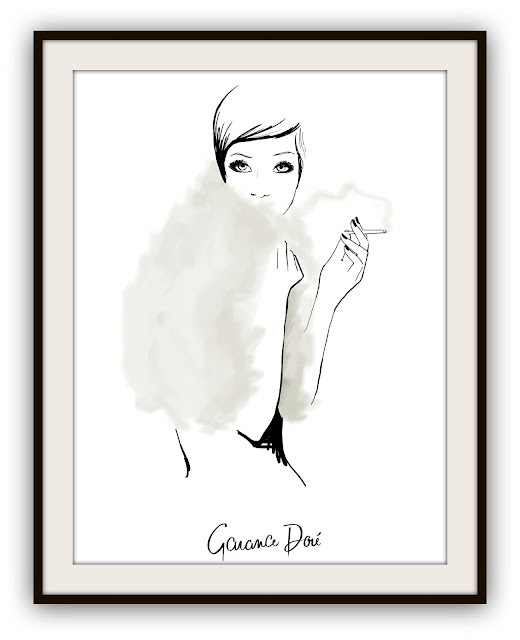 I love the black & white version which will be printed on a gorgeous vellum. A muted colour in-progress version is seen below. 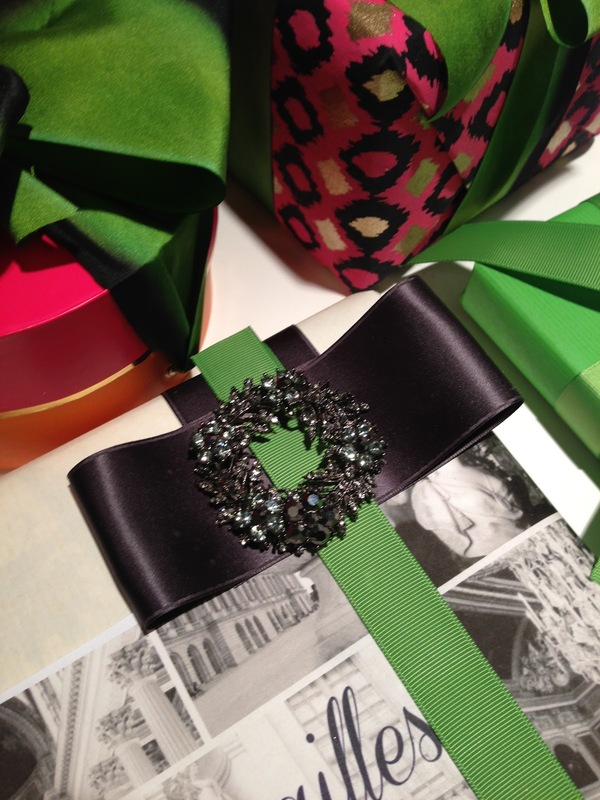 I am using my work samples for this year's holiday wrapping, a fun way to see what works and what doesn't so excuse the smaller size but it does tell me to keep moving forward with this design. No matter how I plan it, it seems I always end up gift wrapping at the last minute. A revolving and early flu set our household back in scheduling but we are busy little elves tonight with wrapping, chopping, setting tables, and doing last minute things. 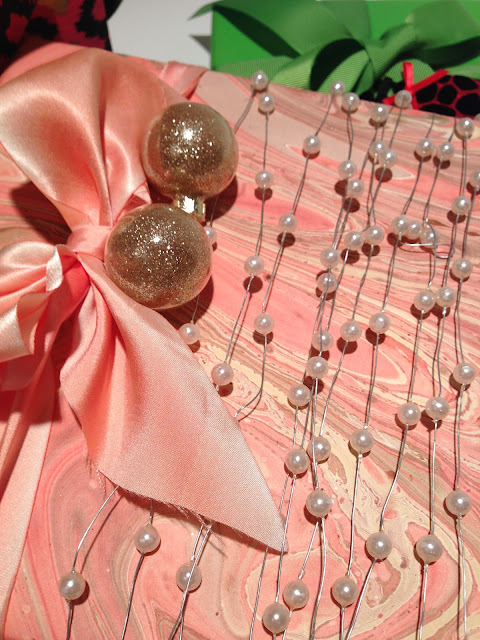 Pearl wire ribbon on marble paper. 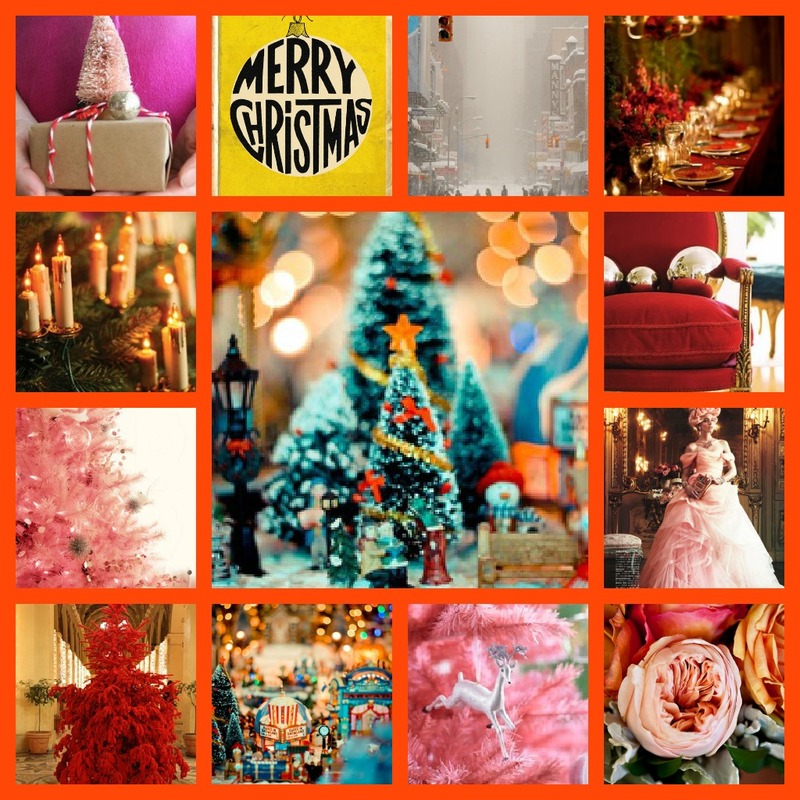 I know all your gifts are wrapped and under the tree........and I am wishing all my wonderful readers a most wonderful and magical holiday season with your family and friends. I know all of us are especially grateful this year for the gift of time with our loved ones. A group of bloggers were asked this month "What are your favorite Christmas Memories"and though most of my Christmas's have included beautiful trees, delicious food, sparkles everywhere, many relatives, and tons of effort the absolute best Christmas memory I have doesn't include any of those things, not one ornament, not one tree light. In fact, it was the quietest Christmas anyone could possibly have, but then again that crazy Mother Nature was involved and you know what happens when she gets going. We still chuckle when we mention "the Christmas in Oklahoma" in 2009, the year our son was on rotation in Tulsa and couldn't come home so we went there, the year the state had their snowstorm of the century, the one where the whole state came to a standstill. Canadians are used to their blizzards, heck we actually kind of like them now and again but Oklahoma doesn't have snowstorms and road-clearing machinery, homeowners don't have shovels, and the whole city was on lockdown for days after the snow had stopped falling. We barely made it out for Christmas dinner (I was determined) and as we traveled down the uncleared, treacherous highway for our Christmas dinner in a friend's 4-wheel drive to a downtown restaurant that I had carefully reserved months ahead (it was also a hotel so all the wait staff had stayed overnight) all I could think was that we were going to spin out of control, be stranded, and no one would know for days, at least until the snow melted. After that tense and dangerous ride, we mostly stayed put in our son's apartment, lined up on his small sofa watching goofy holiday movies, laughing, and watching Oklahoma residents unsuccessfully dig out from under all that snow. I guess in the end that what it means to me is that Christmas is mostly about being with your family, small or large, and sometimes you have to do it differently to help them along and that's alright. We were together. That's all that mattered. 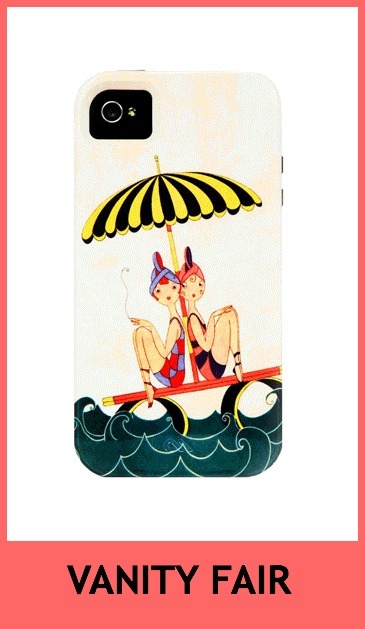 I am keeping my eyes wide open this season for a new iphone cover ever since mine was stolen in Paris. 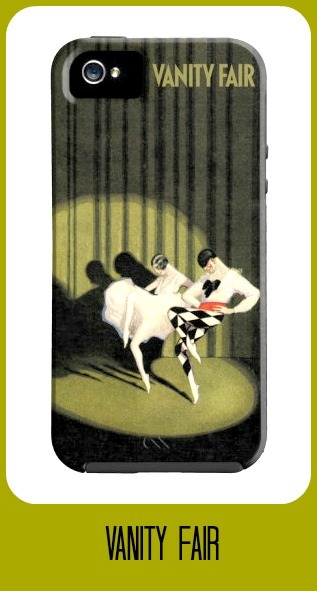 As I look at the ever-growing selection of iphone covers I always think what a great gift item it is..........good selection, good style, and decent price. What else can you ask for in a gift? 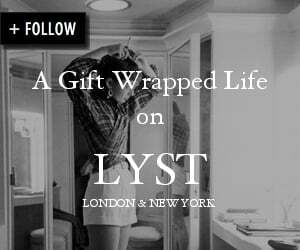 I was over at the Condé Nast website ( I always make it sound like I went somewhere don't I?) 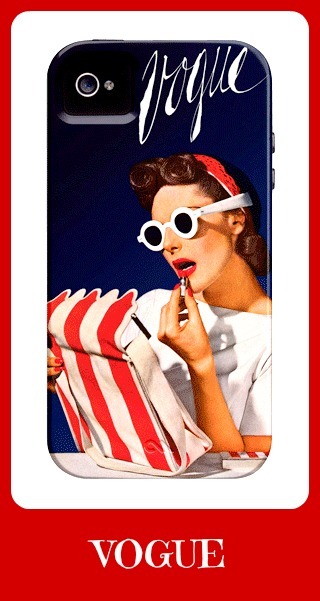 looking at their archive posters from Vanity Fair and Vogue when I noticed they had a new section for iphone covers. 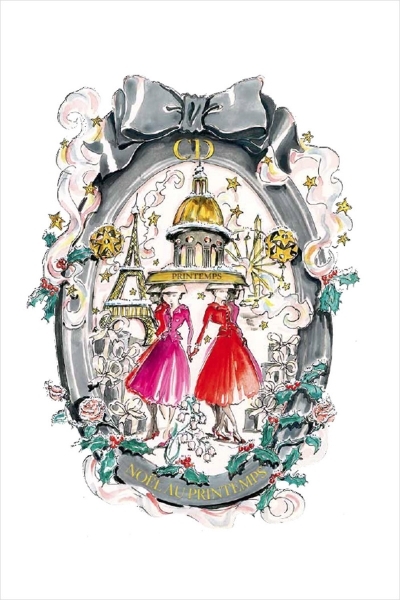 An exclusive and retro collection using some of the iconic illustrations, photos, and covers from the Condé Nast archives, how perfect is the timing? It isn't a huge collection, 36 images at last count but I would guess it will grow if it proves popular, several of the covers are also available in the iphone5 size. 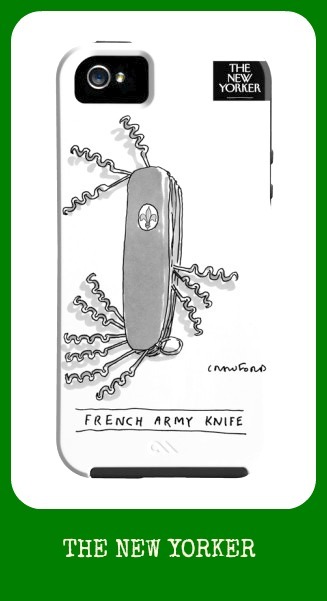 Not only do several styles suit me but I like that more than a few would suit the guys too (how funny is the French Army Knife from The New Yorker? ), especially the B & W photos from the covers of GQ. 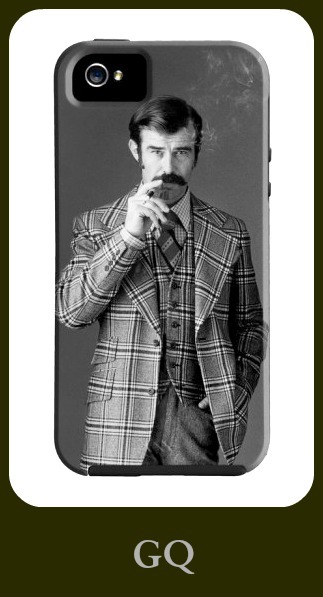 Let's face it, iphone covers make for a great holiday gift...........one is never enough. Old habits die hard and I always think I need something new to wear for the holidays. But truthfully, I already have everything I need and brought some great things home from Paris that I still want to wear. Sometimes, we just need to sit down in our closet and look around, see what we have, take a deep breath................and play, re-style, re-fashion, re-use, and re-invent. Indulge me while I re-style with the help of some fun photo apps. I love drawing arrows it seems. 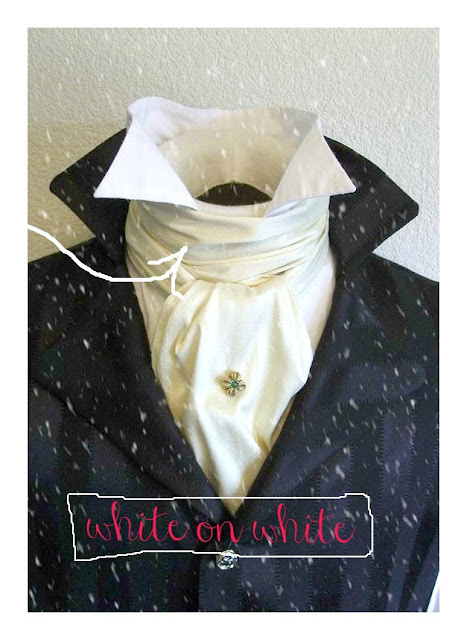 First up....... why have I waited so long to do a Cravat style scarf when I just love, love the look? Never mind that now........I will be re-styling my Anne Fontaine white shirt this way all winter long. Doesn't this more structured style look fabulous for a change? Really good with a vest too. Remember all those sweater wraps we were all wearing a few years back? 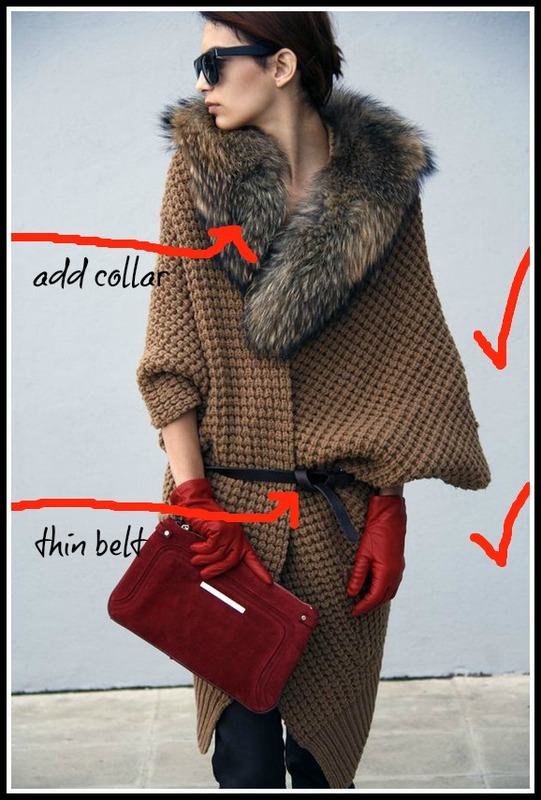 Add a faux-fur collar and a skinny belt and baby........it is cold and groovy outside. Check. Check. I have all three of these things. Plain t-shirt or simple shirt. 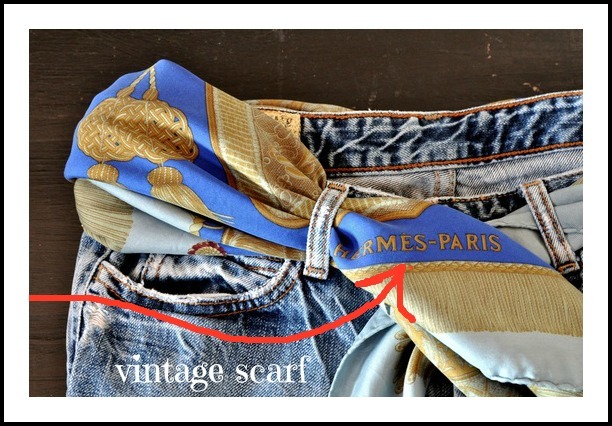 Vintage silk scarf as a belt for your jeans. Perfect for those scarves in your collection that just never seem to look good, by colour or pattern, close to your face.......but they may look really, really groovy going through your belt loops as long as you keep the top real simple. Are you with me on this? I am not sure but this sweater might be at Zara right now I couldn't find it and if it is, somebody should buy it real quick. If not, I think it has some fab DIY potential. 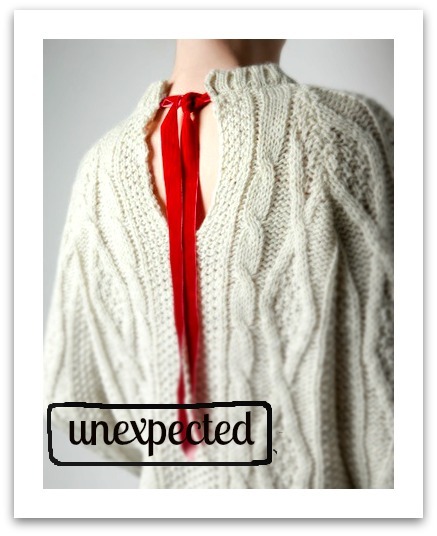 I love this unexpected length of ribbon. 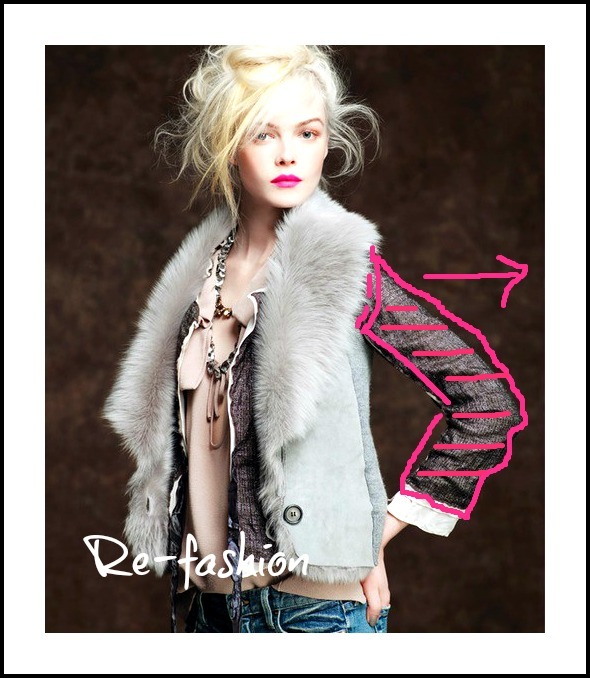 Cardigans buttoned up the back in a 50"s retro way too, anything turned in a different direction is bound to be noticed. This "un-tucked" look has been around for a bit now but darn it, it sure makes wearing a pair of jeans more comfortable and interesting. I am not about to give up this look any time soon not unless I get some kind of Brazilian Booty Lift. Shows off great looking belts too, maybe a glittery style for the casual holiday get together. 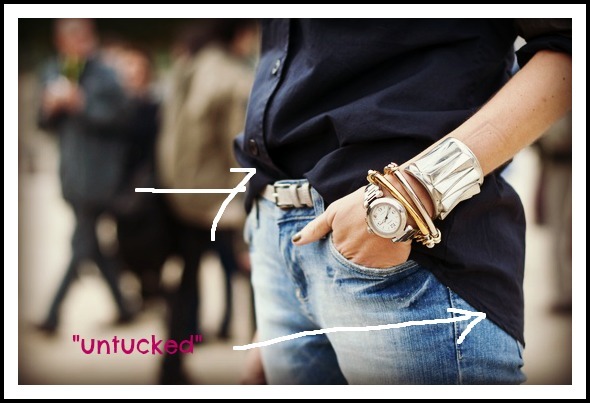 Are you a 'tucked" or "untucked" kind of gal? Personally, I will never be tucked again. 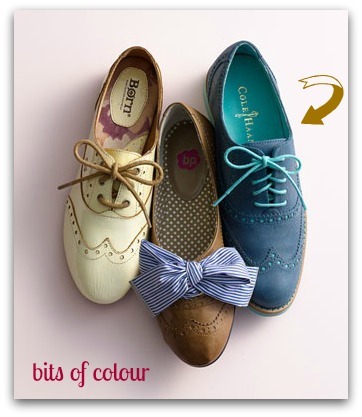 Coloured shoelaces, pretty ribbon to change up the Oxfords.........or brogues. Remember that past Paris post where I predicted huge scarves will be coming around? 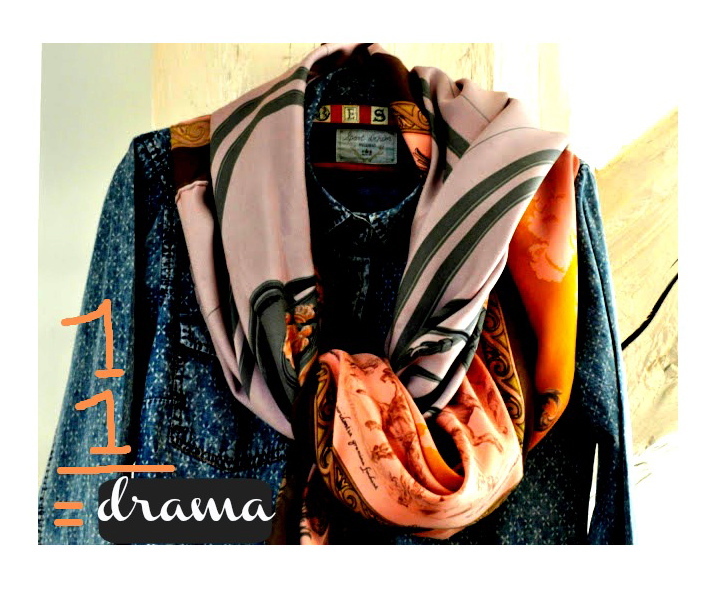 One scarf + second scarf = more volume, more interest, more drama. They don't have to be vintage but start there because I bet you could find some interesting patterns to work this look. 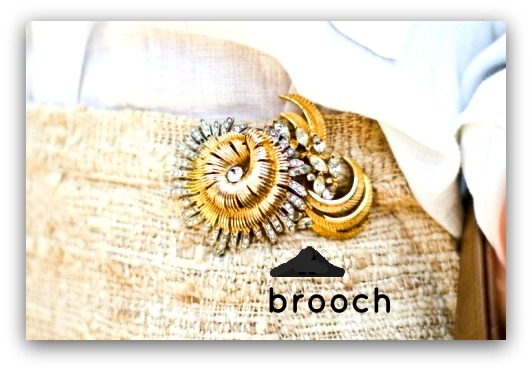 You know I love brooches especially for gift wrapping but sometimes I even wear them and I like the idea of using them in unexpected places, the waistband of a skirt, the center of a cravat, on a wide skirt cuff especially if it is white, and I can't help think one there is an unexpected spot this holiday season that we should consider placing a bit of sparkle. At the bottom hem of a pair of fancy pants, you know those silky Capri style in brocades and patterns, the ones we are all wearing this holiday season instead of party dresses. I think a brooch would look divine there near the bottom outside hem, a bit of sparkle every time you move your leg. I could be wrong but I will let you know. I would love to hear some of your re-styling ideas too! Adorable ceramic rubber poodle stamp from Anthropology. 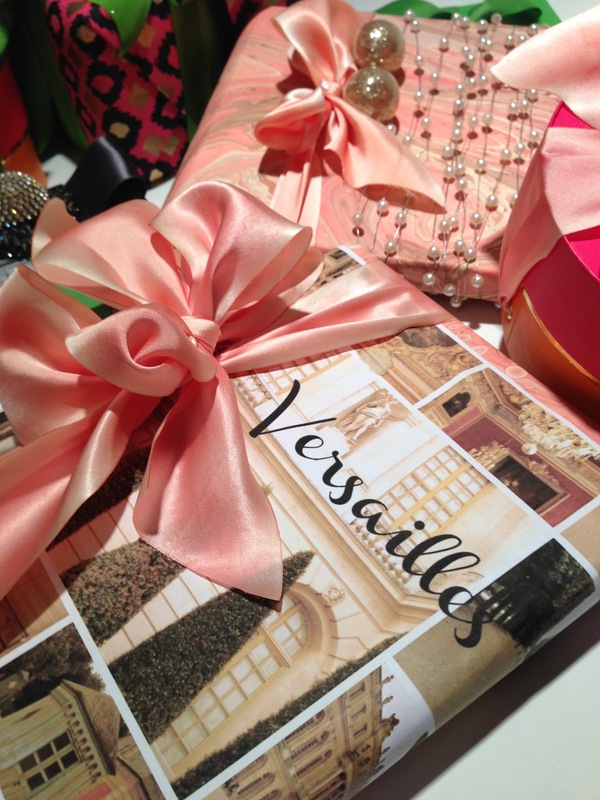 Can a gift get any cuter? 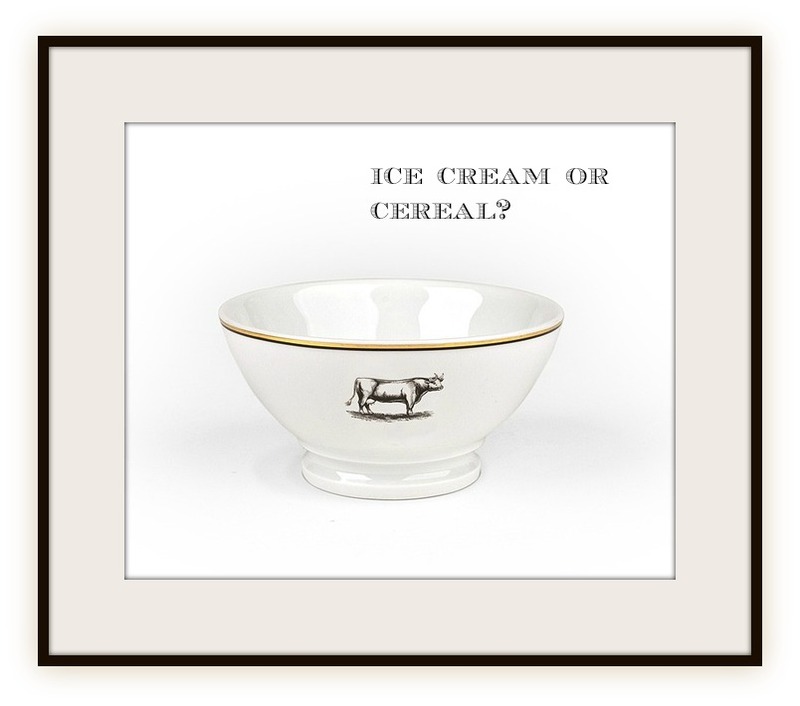 You know it and I know it...........every girl needs a beautiful bowl just for her. 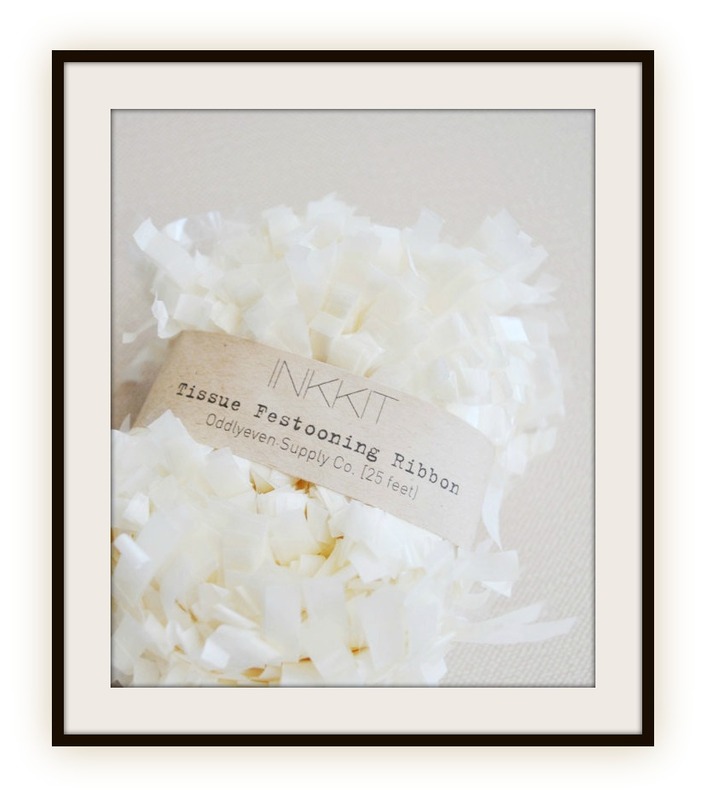 Festooning Ribbon to add gorgeous texture to simple gift wrap materials such a pure white or ivory tissue paper. A Quill & Scroll calligraphy set........everyone wants to try their hand at it. 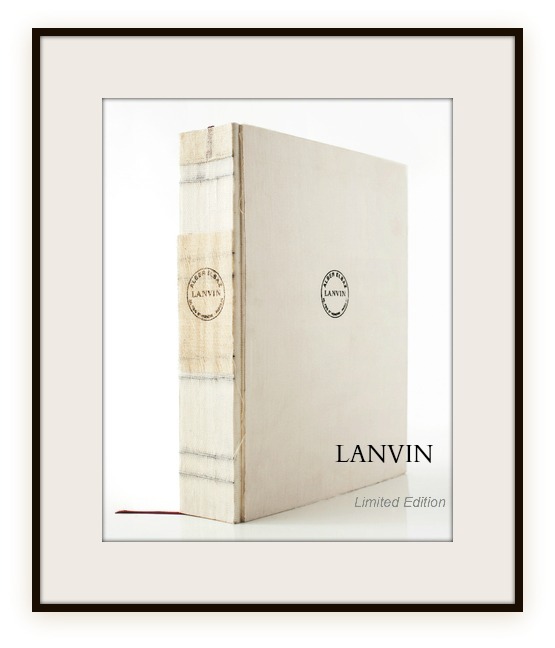 Posh book gifting at it's most sublime.........just saying. Posters online by the blogger superstar Garance Doré........so fab. All the girls will want one. like the new colourful blog header. If you are an email subscriber I hope you will come and see the new look. I still have some more work to do but I like the change. One more thing........have you started your holiday shopping yet? 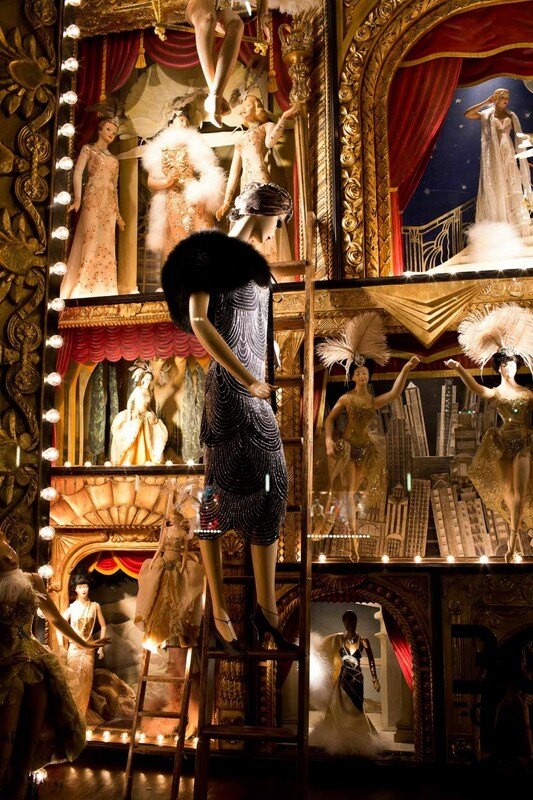 One of the Bergdorf Goodman ~ Follies of 2012 store windows. 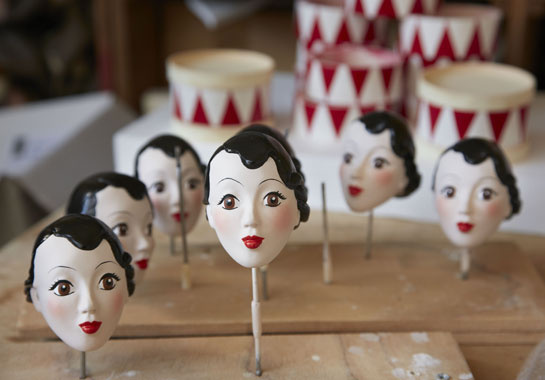 The Follie girls almost ready for their unveiling. I am crazy fascinated by the creativity behind artful window display these days. Just a few weeks ago I wanted to fly to Paris to see the Louis Vuitton and Dior windows and yesterday I casually hinted to my husband that a quick New York getaway to see the holiday windows would be an quick flight for us. Just window shopping honest ........Bergdorf Goodman, Henri Bendel, Macy's, Bloomingdales, and that crazy Lanvin-wearing Minnie Mouse at the Electric Holiday window display at Barneys. If I actually do get on a flight to New York this month it would be due to the BG background story from The Coveteur. 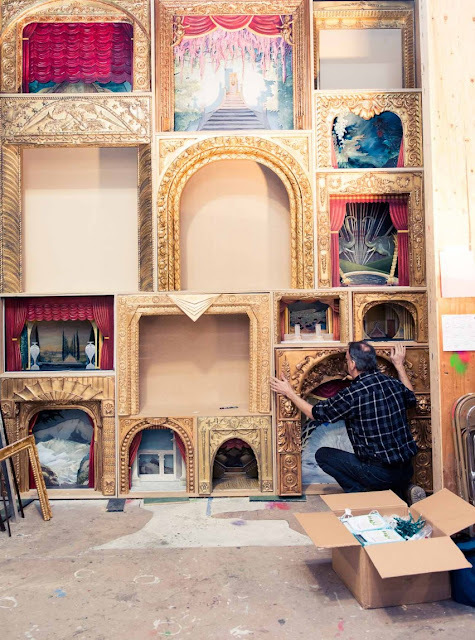 Once I saw the exclusive, gorgeous, behind-the-scenes photos of the Bergdorf Goodman Follies of 2012 taken by the coveteur team, well, I was entranced and motivated. 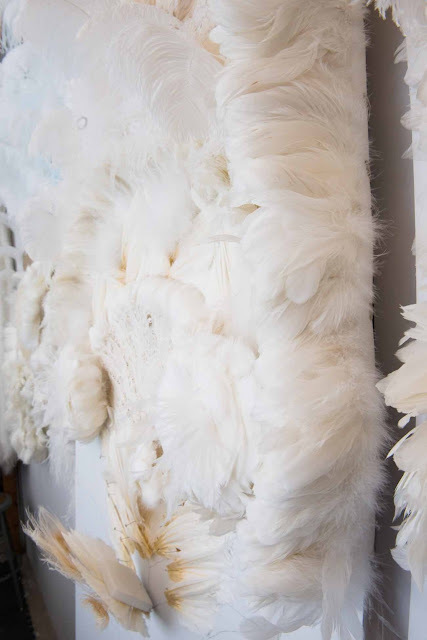 If you are heading to New York for a nose-pressed-to-the-glass experience of your own, then make sure you read the inspiration behind Bergdorf Goodman's 2012 windows from designer/creator David Hoey, it just adds to the background story. Don't forget to have your Instagram app ready this year, seems Bergdorf Goodman loves this social media thing and is having a BG Windows ~ Instagram Contest and your clever instagram photo entry could win some cool prizes, real BG window props (they mostly re-use and re-fashion props in case you were wondering) from the holiday displays or one of the final photos from the Coveteur photo shoot. Interactive window shopping..................I can do that. I'm in. 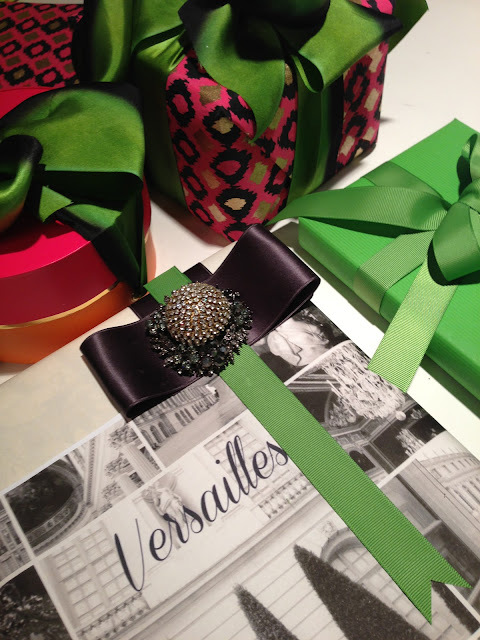 On one hand, you are going to love me for showing this unique and original gift wrapping idea that is coming out of the UK from London-based Harrow & Green. On the other hand you are going to want to strangle me because this very, very clever gift sack is Sold Out for the moment but................. but the owners are hoping to catch up and fit in more orders in mid-December so some website stalking is in order this year. Seems too many clever gift-wrapping elves just loved this personalized idea and you know how popularity can hold up a production line this time of year, even the ones way up north. 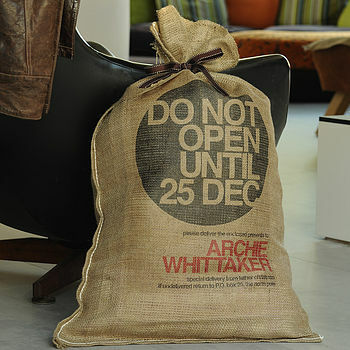 Being that the gift sack is soooo popular, you should consider ordering now for next year, yes............. Christmas 2013. The only reason I am so unfairly mentioning this sold-out item from London-based Harrow & Green is because this is one of those festive keeper items that everyone is eventually going to want to order, parents and grandparents are crazy for personalization and rightfully so. They last for years so it might be worthwhile to bookmark or pre-order and plan ahead. Just keep this great idea under your little red furry hat. 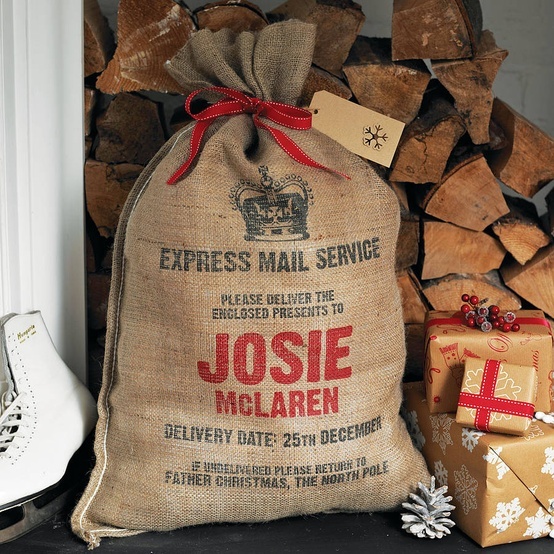 Made of top-quality hessian know as burlap in North America, the gift sacks come in a variety of styles to suit any age and individual names are added in red letterpress. Sort of a stylish replacement for Christmas stockings though there is nothing to say you can't fill both! 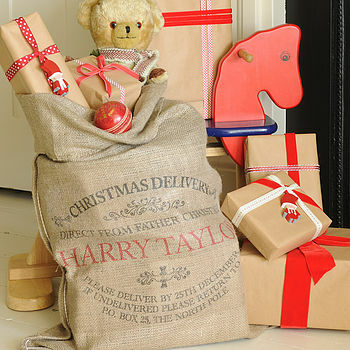 Perfect too for large gifts, the rustic gift sacks come complete with grosgrain ribbon and gift tag.............and a whole lot of gift fun. How fabulous would these look under those great big Christmas trees? With my name on it? 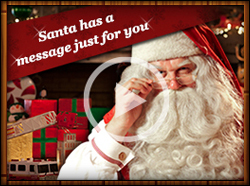 And speaking of the North Pole, it's time to pass along my annual holiday link to PNP, top secret code for Portable North Pole, that charming and magical free video message you can send to true Santa believers. Those little ones older ones too are downright mystified and enchanted when Santa actually says their name and seems to know some personal details like their dog's name or favorite car.........well, it is downright magical and very, very clever too. It is my favorite time of year. 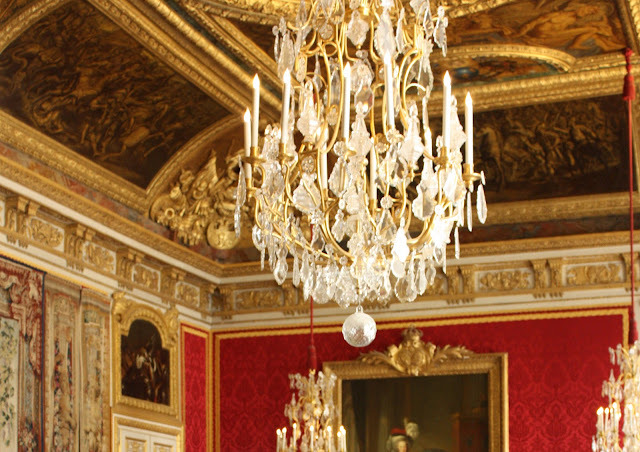 A day ahead of royal appetites, princely portions, and I imagine some gorgeous table settings with linen tablecloths, polished silver and sparkly crystal chandeliers all aglow. I know many of you are getting prepared to share your own castles with family and friends and hope you are enjoying the table and food preparations..........all the special touches that say welcome to our home. If your dining room walls are painted red or covered in red silk as they are at Chateau de Versailles, know that red stimulates the appetite and be prepared to dish out some second helpings of turkey and pumpkin pie. As we all know, Louis XVI was well known for his love of second helpings. 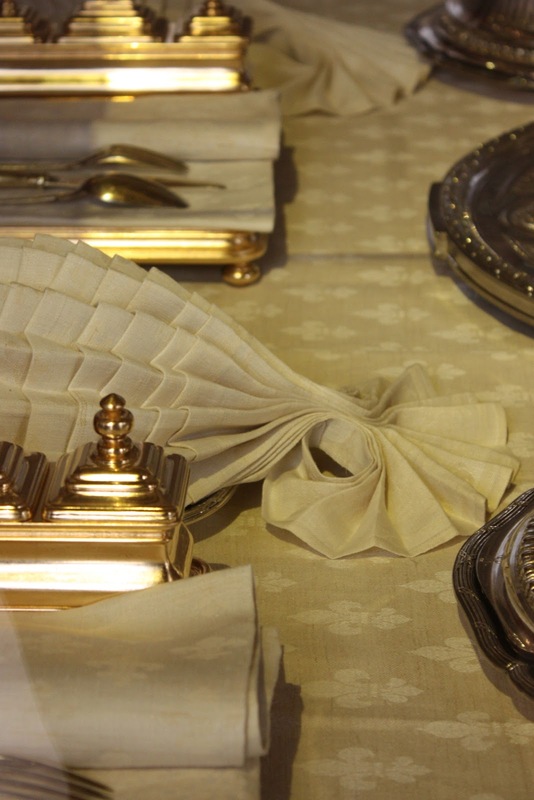 Even though I was forced to snapping photos through protective glass of the dining chamber King's Private Apartments at Chateau de Versailles, I thought it worthwhile if only to remember how precise the napkins were folded back in the day. It is a housekeeping art and I do admire the skill that this must have required though a part of me even the Downton Abbey loving part thinks we should all be truly thankful that this level of precision isn't required of today's hostess, even royal ones........my goodness, fine linen folded into pleated layers in two directions and folded into the shape of a scaly fish? How do they do that? Others would be impressed with the amount of silver service, not us, we were fascinated with the napkin folding techniques. This style looked like a huge blossoming flower. And the rich red walls and velvet chairs. All fit for a king and his queen. Imagine eating with a audience each and every meal. I would be way more comfortable being the one folding the napkins into intricate shapes..............and then heading out to yoga class to work off the pumpkin pie. Or so I say. Though it is a magnificent pleating technique isn't it? Something to try with soft tissue paper perhaps? However you set your holiday table, whether it be stainless or silver, cotton or silk, pewter or silver, paper plates or china, have a most wonderful holiday with your family and friends. Spend time together. I am all over the place these days, I have a bee-in-my-bonnet as they say and trying to pull my thoughts together in too many directions. 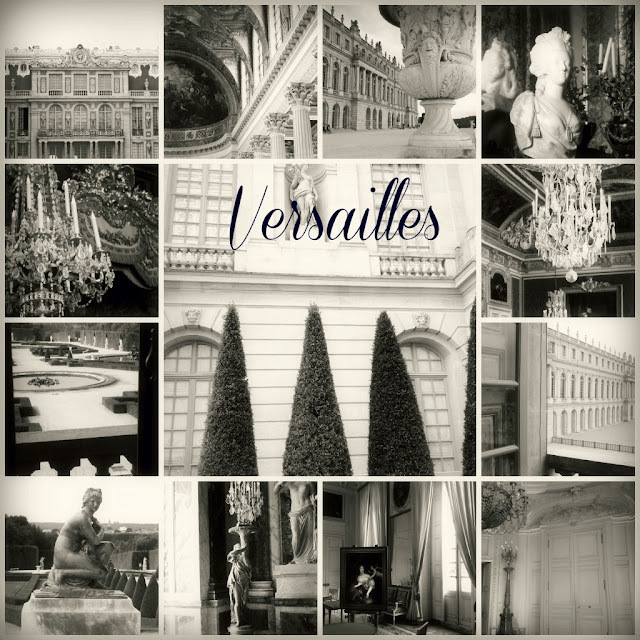 So let's slow walk this week through my favorite parts of Versailles, the calm parts where you can rest your eyes. When you think of Chateau Versailles as a whole, calm is not the descriptive word that comes to mind, you think extravagance and visual excess, and Versailles is all those things but there are parts where it all comes together in a beautifully serene manner even when all the components tell you that it shouldn't be possible. 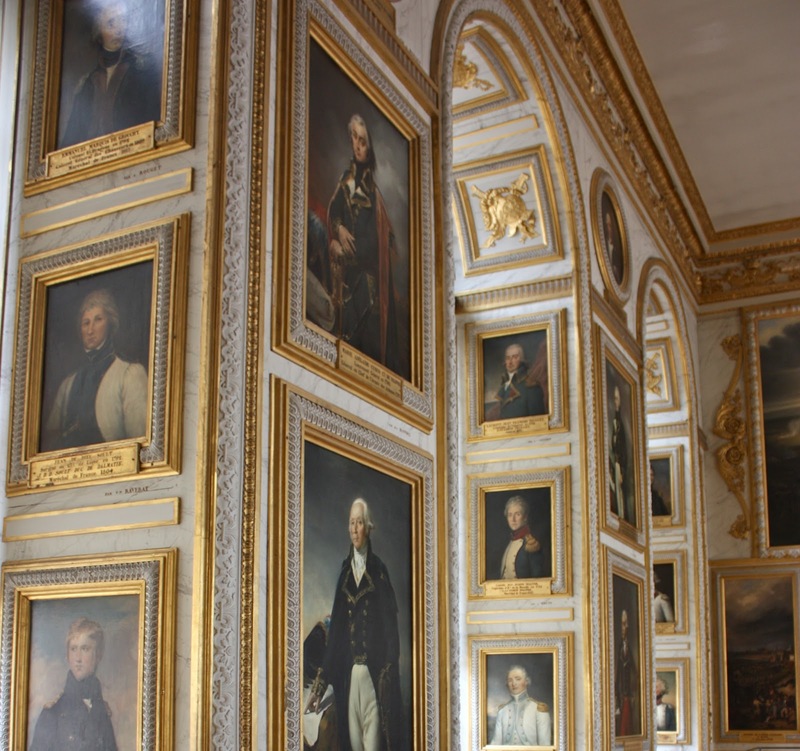 This is one of my favorite photos that I took the day we visited Versailles (even though I had to crop out the bottom due to unsightly repair barriers), I think it appeals to the designer in me, a reminder, a lesson in the value of symmetry. 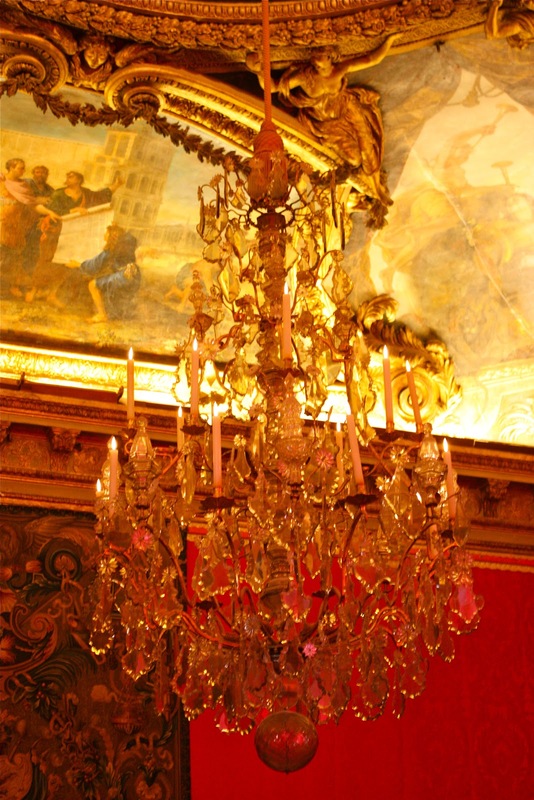 All that gilt, carving, moulding, subject matter, and yet it remains calming to the eye.............amazing. I am sort of hoping that Santa might spring for an early Christmas present and put a quick December flight to Paris under the tree. Already? Yes, especially after reading who is working around the clock right now to "dress" several department store windows in Paris this holiday season. Honest, I could be there and back so fast it would make your head spin because this will be a magical sight to see.......... multiple windows of two famed department stores dressed by two fashion houses and in the same Parisian 75009 zip code, just a block apart. Who would have thought? Louis Vuitton at Galeries Lafayette and Christian Dior at Printemps........ahhh, Santa is being really good to the window watchers this year. 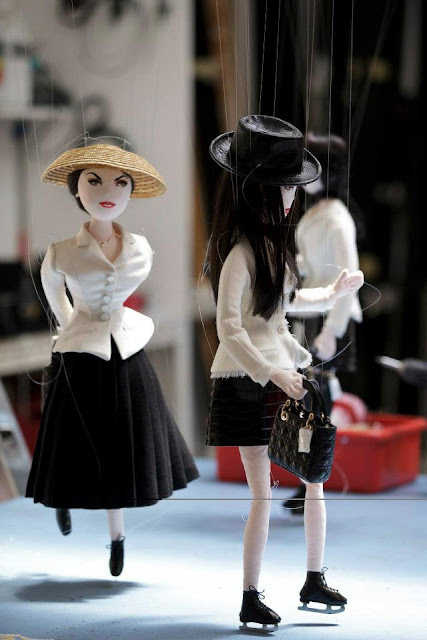 Surprisingly, both Louis Vuitton and Christian Dior are using hand painted and animated marionettes but I have the feeling the similarity will only add to the enchantment for young and old alike. This is only a teaser but I love the behind-the-scenes peek. 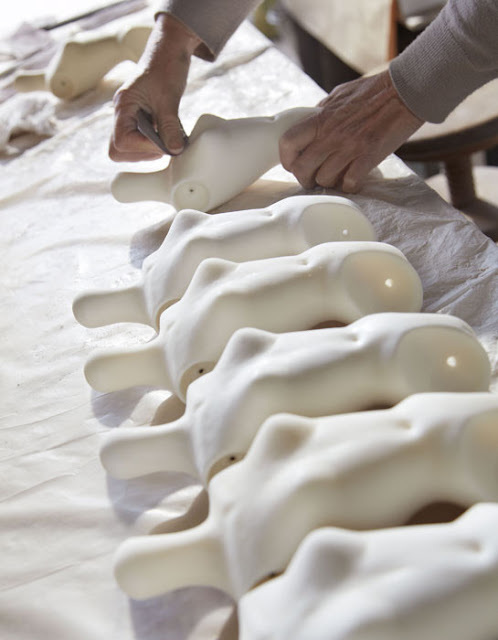 Wouldn't it have been wonderful to see the level of detail and workmanship being executed by the world's most famous trunk maker over the past months? 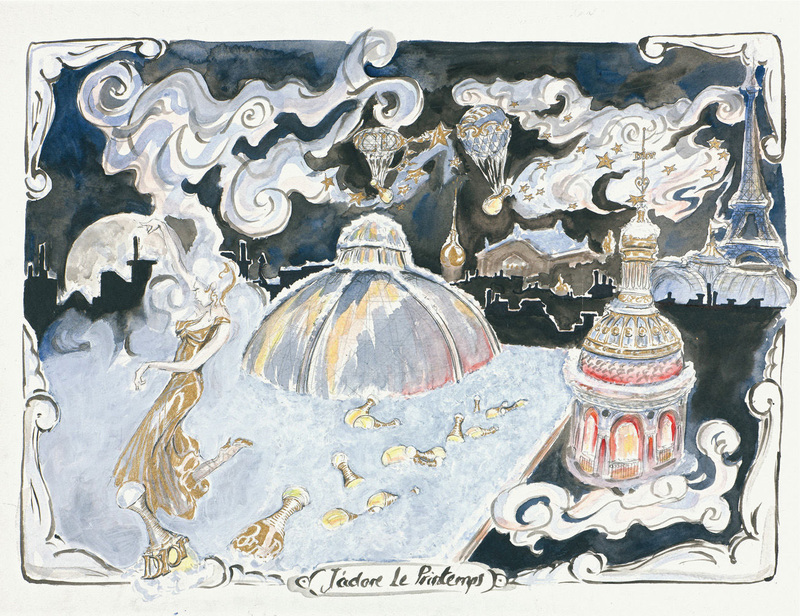 Louis Vuitton has used travel as it's theme in honour of the 100th anniversary of Galeries Lafayette and the windows will unveil this month, but no one is saying an actual date. Maybe it is today? Maybe the exact moment that every thing is absolutely perfect. 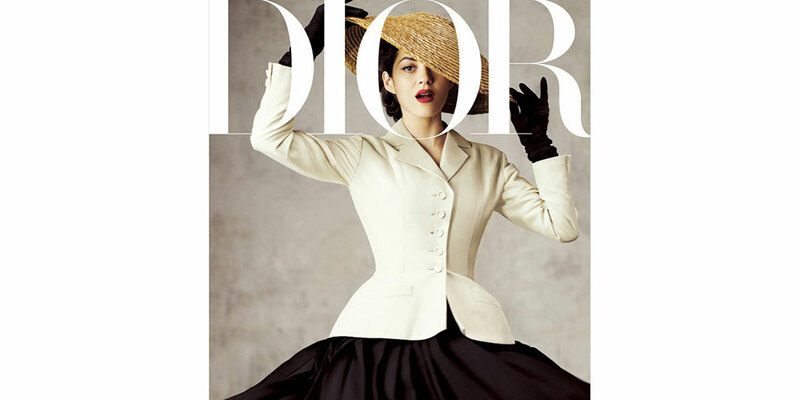 Using many of their iconic Dior fashions from the famed 40's"Bar Suit" all the way to the red gown designed by current artistic director Raf Simon, the Dior windows are designed as an archival ode to the historic Dior couture salons on Avenue Montaigne. Even bigger news? 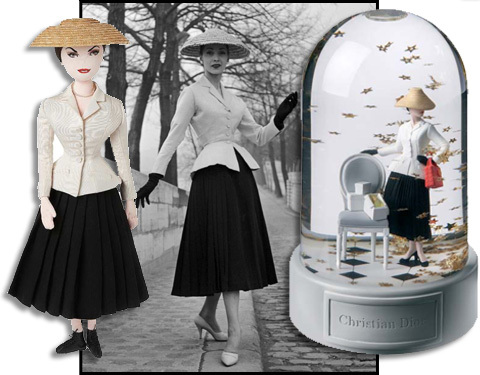 A exclusive Christian Dior Pop Up store located in Printemps this holiday season, a merchandising first for both the designer and department store with more than 30 limited-edition creations such as snowglobes, scarves, bags, even shoes. Now we're talking some fun holiday gifting. 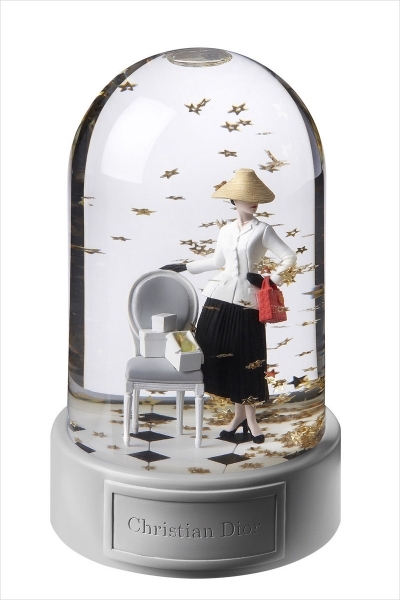 I love snow globes. 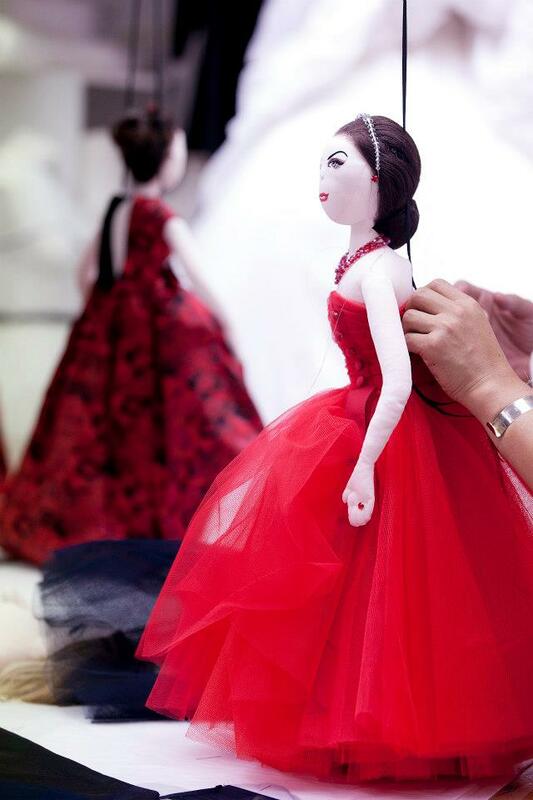 The Dior ladies getting dressed up for their holiday preview at Parisian department store Printemps Haussmann.
" Christian Dior Limited Edition Snowball"
Who better than current Dior "face" Marion Cotillard to unveil the Dior windows at Printemps on December 9th? Get there early for the 5:30 pm open, I think it might be a busy street that night and all month long. Maybe get in line right now.